University College of Engineering, OU ME/MTech PTPG Admissions 2019/Part Time PG Programmes in Engineering Admissions 2019: University College of Engineering, Osmania University, Hyderabad has given Part Time Post Graduate Programmes in Engineering 2019 /M.E / M.Tech (PTPG) Admissions 2019 notification under Centre For Continuing Engineering Education Programmes (CEEP). The UCE invites applications from the eligible candidates having one year post qualification experience for admission to six-semester part time post graduate programmes in the following disciplines. a) B.E/B.Tech of Osmania University in the Concerned discipline, or its equivalent. b) AMIE/AMIETE or similar qualifications recognized as equivalent to B.E/B.Tech. 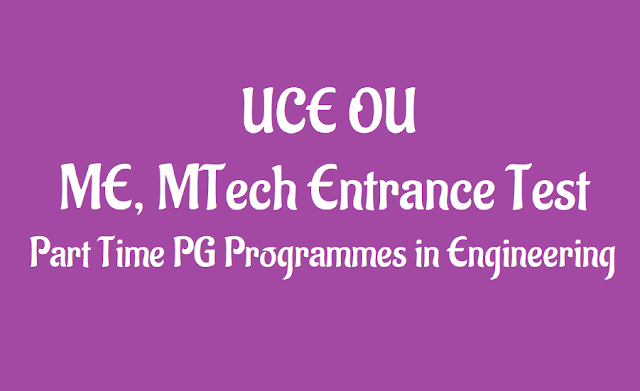 c) For M.Tech (CSE) with specialization in (Computer Science & Engineering) B.E./B.Tech./AMIE in any branch of Engg./Tech. (or) Equivalent Masters Degree in Physics, Statistics, Mathematics or Applied Mathematics, Applied Statistics, Applied Physics, Geophysics, M.Sc. (Comp. Sc. ), M.Sc. (Information Systems), (Computer Applications and Electronics) and MCA (or) Equivalent. B. Minimum of one years experience, as on 30th June 2019, reckoned from the date of qualifying degree. C. Admissions to all programmes will be based on the performance at the entrance test. Candidates who secure a minimum of 36% marks in the Entrance Test under General and Backward Class category and 15% marks under the Scheduled Caste/Scheduled Tribe Category will be considered for admission. In case of a tie at the entrance test, date of birth will be considered and the older candidate will be considered for admission first. 1. Each application must be accompanied by Registration fee in the form of a D.D for Rs.1000/- drawn in favour of “Director, CEEP-Admissions, O.U.” payable at Hyderabad. i) in person or by post, on or before 06 June 2019 (Saturday) by 5.00 p.m.
3. No application will be entertained thereafter either by post or in person. 4. The filled in application form dispatched through post is to be super scribed "Application for Part Time P.G. Admission in---------------------programme 2019-2016”. iv) Valid Community Certificate as per the State Govt. Rules in force. v) Service Certificate and permission letter from the employer. vii) Memorandum of Marks of the B.E. Examination/ M.Sc./M.C.A./AMIE/AMIETE. viii) Conduct certificate issued by the Principal of the college concerned/Head of the Department / Organization / Institution where working. ix) Income Certificate obtained on or after 01.04.2019, (if applicable). ii) with registration fee of Rs.1000 + late fee of Rs.500 : . 4. Dates of Entrance Tests: (Saturday & Sunday). 5. Results of Entrance Test will be displayed on respective Department Notice Board on ..
For more details including Application Form to be downloaded are available on websites www.uceou.edu , www.osmania.ac.in.